Secret Golf's Steve Elkington and his long time friend Rocco Mediate on golf and cooking Italian food. ROCCO MEDIATE: You ain't got it today. -Yeah, I do. Me-- nuh-- nuh! -Aw, see, he's lucky. He's lucky. Get that ball out of the hole. That was a blast. NARRATOR: The buck stops in Blaine, Minnesota for the Elk to catch up with longtime friend and fellow competitor, Rocco Mediate. -One of the things you and I have enjoyed about begin together the most is we like to talk about our swings. 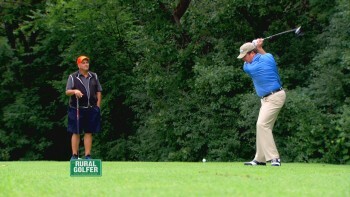 NARRATOR: With local flavor on his side, Rocco gives Elk a taste of golf Midwest style. -We have fun when we play golf together, Rocco and I do. -And that's what we're going to do forever. STEVE ELKINGTON (VOICEOVER): Everyone loves Rocco. He's that-- he's that guy that's fun to be around. -What do you think about that one? STEVE ELKINGTON: You filthy animal. NARRATOR: And the guys prepare for a different kind of course on The Big Show. -Not bad after a long day of golf and work, huh? -Still eating eating. Dinner was one of the most-- most memorable experiences I've ever had in my life. I felt like I was in Sicily. NARRATOR: Rural Golfer rolls your way next. THEME SONG: One, two, three, four! We've got the big show revving to ride around the map. Where we're going next we just can't say. Just grab your clubs. Let's hit some balls. We'll be making friends and playing golf. The Rural Golfer's coming your way. STEVE ELKINGTON: So we're going to play a game of golf today around here, you and I. Where are we? ROCCO MEDIATE: We're in Edina, Minnesota at Braemar golf club. The parking lot's packed, its what, 8 o'clock? -In the morning on a Monday. -Yeah, on a Monday morning, Yeah. Packed. -One of the things that you and I have enjoyed about being together the most is we like to talk about our swing. -Well, first of all look at his address and his posture. There's not a lot of-- there's no slouching over. There's nothing. The club mo-- I mean, I-- what do I have to say about it? -Which way do you go? Like for me, I go too slidey. -I go too-- I lift too much. I lift. I lift. STEVE ELKINGTON: Like a-- Claude Harmon used to say, you look like a man holding an umbrella. -That's exactly what Ricky said. That's where he got it from. He goes, you're holding an umbrella, son. What are you doing? -Rocco only plays with 55 degrees. -You don't have a 60? -But he hits as high a shot as you have ever seen. -Maybe you show me how to do that today. -I will. I'll be happy to. We'll take it to the course and see how it works out. STEVE ELKINGTON: Yeah, let's do that. -All right. To the cart. -To the cart. So do we know where we're going? NARRATOR: With its beautiful landscapes and mild summer climate how can Minnesota, land of 10,000 lakes, be known as anything but a desired golf destination? It worked so well on professional golfer Rocco Mediate that it's a destination he now calls home. -It's a really cool part of the country. I mean it's 75 degrees today. It's almost August. Oh, we're spoiled rotten. We moved here last May and in the summers it's fantastic. NARRATOR: Because of its northern climate and fertile land, golf in Minnesota, especially in late summer and early fall, is in a class of its own. -It's the number one in the nation per capita golfers and we have what? Five months up here maybe that we can play? It's unbelievable passion out here. Unbelievable. -Please come into my humble horse trailer. Oh my gosh. Look at this. Vegetables, fresh. -They're just picked from the farmer's market. We have some Yukon Gold potatoes. We have some red potatoes. We have some shallots. Some heirloom tomatoes, some white and red onions. And we have some beets. -Whoa, whoa, whoa, hold on. Can we do English? -What's this Italian stuff? Yes, we could do English. -Rafaele's got some ideas for what he's going to cook tonight. STEVE ELKINGTON: We've got some wine. CHEF RAFAELE: We've got a little wine. Yes. It cannot be an Italian dinner without wine. Got that. So what we're going to do is appetizer we're going to do a bruschetta. Traditional Italian appetizer. The next one I would like to do is the carpaccio. 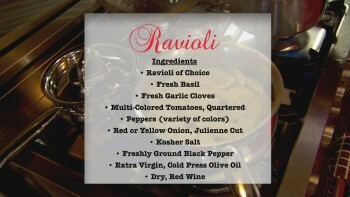 CHEF RAFAEL And then we're going to do ravioli. Get started with fresh scallion, onions, garlic, a little basil on top of the ravioli. STEVE ELKINGTON: And then you're going to do some lamb. STEVE ELKINGTON: What do you think about it? Do you feel it? -It's going to be phenomenal. I knew it before I got here I think. ROCCO MEDIATE: So what's up? What's going on here? You've got basil. -Fresh basil. Just picked it from my garden. STEVE ELKINGTON: Rocco, would you like to wear my hat? -Um, yeah, let me have your hat. -Because I'm not wearing that. I gotta wear this. -I'm kinda out of my deal. ROCCO MEDIATE: Put it on. -I'm out of my deal. -Le me have it. Alrighty. Oh yeah. That's-- I might just use this all the time. STEVE ELKINGTON: And we'll flip this over here. -I don't want to hear anybody from that side. STEVE ELKINGTON: Criticism from me. CHEF RAFAELE: OK, pay attention to me now. -So anyone can do this is what we're saying. STEVE ELKINGTON: Yeah. You get a little garlic. You get a little basil. -I start this this way here. STEVE ELKINGTON: Now tell me about the tomatoes. So you got the heirloom there. -Which is my favorite of all time is the heirloom. STEVE ELKINGTON: A little pepper. Two or three twists, four or five twists. Seven and a half twists. STEVE ELKINGTON: Just to give it a lttle. Give it a little. CHEF RAFAELE: I have the bread over here. Right here. You need to slice that. They actually based the name of the dish. You know that, right? STEVE ELKINGTON: No. I don't know that. CHEF RAFAELE: Bruschetta is not the tomato. Bruschetta is the color of the bread. CHEF RAFAELE: Bruschetta is the time of the day when it's almost dark. ROCCO MEDIATE: We're going to give it a little toasty. STEVE ELKINGTON: Oh you-- and then. STEVE ELKINGTON: It's so good right there. CHEF RAFAELE: --red, green and white. ROCCO MEDIATE: Oh yeah. Look at this. STEVE ELKINGTON: And then you put that on top of that and it's magic. I could do that easily. ROCCO MEDIATE: Anybody could do that. STEVE ELKINGTON: You could. I think I'm going to change my name to Stephano Elkingtini. STEVE ELKINGTON: Rafeale, what are you thinking about doing in the next move? -The next one I would like to do is the carpaccio. STEVE ELKINGTON: What is this guy right here? -This is green baby arugula. ROCCO MEDIATE: That's genius with this. -And we're looking at this slab of meat over there. What are we look-- what are we talking there? STEVE ELKINGTON: So you cut it as this as you can, squish it out with your knife. And why can we eat that raw? CHEF RAFAELE: You have lemon, salt, pepper that cures it. -Well what do we got here? -Mm-hmm. This is another way to cure it. ROCCO MEDIATE: Very salty little devils. STEVE ELKINGTON: Are they? OK, it's time to sit down. ROCCO MEDIATE: It's time for another round. STEVE ELKINGTON: What wine are we doing with this one? -I never thought I could do that. NARRATOR: The quaint little town of Edina, Minnesota, is defined best by its farming roots, rolling hills, and countless scenic lakes. And its amid that natural elegance where you'll find Braemar Golf Course. It may be only a quick drive for Minneapolis but once you get there, well, you're a world away. -We're in the middle of a metropolitan area but you wouldn't know it by looking at the surroundings. All the trees-- this used to be a farm with no trees. In 50 years this is what's grown up and um, it's a beautiful spot. We're a 27 holed par three championship course and a driving range. Our 12th hole is our signature hole. It's a short par 3, but it plays down to a green. It plays about 140. But it actually is a wedge, because it's straight downhill. But that's kind of our signature hole. It's beautiful. You can see a lot of area around you. So it's a great spot. We have a 19th hole. That's our third nine. Starts and 19 and goes to 27. -It says the 19th hole. ROCCO MEDIATE: That's my favorite. Isn't that your favorite? -It is. It's got to be our favorite. -Why is it a hole, though? There's no nothin'-- no bar or nothing around here. -Should we-- should we get some drinks for this hole? ROCCO MEDIATE: It looks like a nice hole though. -We run what we call speedy play here where we use all three nines and you tee off and you play all different combinations. So whenever you do that you're playing 1 to 18. You might play 10 to 27. You might play 18 to 9. Any level can play here. Especially the front nine, back nine. It has tee setups were it can play anywhere from 6,800 yards down to about 5,800 yards. We can handle juniors and any level of golf. ROCCO MEDIATE: When I was a kid in Greensburg, I was at the golf course every day in the summer. 7 o'clock till dark that's where I was. We had a lot of junior golfers. Four, five, six years ago, when I go back to Greensburg, there weren't that many junior golfers. They have 900 here at Braemar which is-- first of all it's unbelievable. It's a lot of kids. And just looking at them right now, there's a bunch of them right here just hitting shots and putting. That's what I did. I think that's what all this did is when we were kids. -We need to have these kids play. They start so young in sports that if we don't give them started young in golf we lose them to hockey or other sports. So we want to get them started. We start them here at 6 in group lessons. It's going to keep this game alive. That's why guys like Rocco and Steve play this game as well as they do. They still probably feel the same way. It's still a journey. And there's no destination. There's no end to it. -We're going to try to help folks just kind of let them know what we do on off days. -And, you know, and what we like to do, shape the ball. -That was really punished. See I love that flight. It's so controlled. -Rocco and I have found ourselves in a devilish position here. We see the flag is tucked in around there. These are the shots the pros make insanely easy to do. OK. So we're going to have to curve this ball around the trees. We're going to show you and tell you how to do it. -A little slight hook around a tree. I love that. I just-- I've always seen-- not always but last 25 or 30 years of playing I've always seen the ball fall left. 99% of the direction of the ball when it comes off is from the face. OK? So where that ball starts from, where it starts is directly responsible from the angle of the face at impact. -Now, to make it curve the path-- the path of the club-- the path it is traveling would need to be to the right of that. Like if we're playing ping pong and flat back like this and then I go-- keep the bat the same but then I go, whew. You got a big little top spin draw there. -So to make a draw the path has to be right of the face. First thing is we have to determine what the start line is that we are going to start this ball on. And obviously we've got the bridge, we've got those cattails. And we see the big stand of Cottonwoods. We've got to give a bit of room so let's call it-- let's call it that-- OK? -We'll call it that. You like that? - --that will put curve on the ball just like a ping pong back, OK? There is no hooking of the ball with turning your hands. OK. Please demonstrate. -So yeah, we're going to start somewhere over here. STEVE ELKINGTON: To make a draw the path has to be right of the face. ROCCO MEDIATE: Here we go. -Oh my God, that's absolutely perfect right there. The first-- first flag. -So what are you making now? -I'm making the fresh tomatoes. We start with fresh scallions, onions, garlic a little basil. And then we put olive oil and tomato in there. They're cooking-- they're reducing down. -You kind of let it reduce down, and then they're going to go where? CHEF RAFAELE: On top of the ravioli. ROCCO MEDIATE: On those raviolis. CHEF RAFAELE: So we just take it out, drain the water, and then we put the sauce on top and we serve it. ROCCO MEDIATE: That's going to be ridiculous, that sauce. Look at that. You see how it's served? Look how light. -What's in the-- what's in there? Inside of that? ROCCO MEDIATE: So you talk about light. look at the sauce. Look at it. It's genius. -Mr. Rocco, your turn. You want to push the plate in so I don't burn you. ROCCO MEDIATE: I will do that happily. CHEF RAFAELE: You have to play golf, you know? I don't want to injure you. ROCCO MEDIATE: I mean, really? Come on. Look at that. Yeah. STEVE ELKINGTON: I just like everything. JESS: So are these things you feel like you can go ahead and cook yourself? -Look, I can do this in the big house by myself for sure. But I'd like to share it with more people. I think what a lot of guys that watch the show-- I want them to understand and I want you to either confirm or not confirm this. -Everyone sort of has a swing. Mr. Burke talked about this. Every player has his own swing. STEVE ELKINGTON: And those parameters that make that thing work. You know, we've seen guys like Jim Furyk, we've seen guys like whatever, Roy McIlroy was pure. All kinds of different swings, right? -But there is a honey hole for you. -That's what guys gotta get. ROCCO MEDIATE: Yup. And sometimes that one key you're working on if you agree with this or not, can last year's or minutes. -We have found ourself on the right side of this fairway and we're going to demonstrate how to get yourself out of trouble with the fade shot. Now a lot of people have slices et cetera. But they get them when they don't want them. -Great players can move it both ways but they have a shot. If I need to have it it's going to go to that way. If Elk needs to have it it's probably going to fall to the right. Stuff like that. So you can't mess with that. You've got to get better at the other ones to keep you honest. -I'm putting a club down here to show the start line. So the club face, remember this, 99% of the starting of the ball represents by where the club faces at impact. So we're going to aim our-- we're going to aim our club face down this line. It doesn't really matter where the stance is. To put curve on it we are interested in the path of the club. There is no curving by twisting your hands. Let me repeat that. There is no such thing as making the ball curve from twisting your hands. So the path of this club-- the path is over here. Face on that one, path on this one. So we put the path on it and that's what puts the curve on it. When you go slice bend you've got to add a club. ROCCO MEDIATE: You gotta add at least a club, right. -Hemispherial twisting of the gizmo. STEVE ELKINGTON: This is going to be awesome, I can tell. There we go. Hear a difference in the sound? ROCCO MEDIATE: That'll work! Woo! [CLAPPING] That was ridiculous. ROCCO MEDIATE: A little soft slider. STEVE ELKINGTON: To me, I like to hit the flag because it's the most reliable. I've won the most tournaments. It's served me well under pressure. But I mind going right to left. STEVE ELKINGTON: I want to talk a little strategy on the 14th hole at Cypress. And you come out of the shoot back here and then it's almost got a clover shaped green. And depending on where you put your tee shot on the fairway, it sets up the angle where it's got some very difficult second shots. You've got across the water shot. You've got across the water across the bunker shot. All sorts of problems here. The way I play this hole is I always play a fade shot off this hole, because if I miss it, I want to be over here in the right side of the fairway or even in the trees because then I can fade my second shot out and I can keep enough air time up under it to be able to do something with it on the green as opposed to if I hook it over here or finish in the left trees. A hook shot out, I can't keep it in the air. It's coming in too hot to do anything on the green. Just from experience it just hasn't worked out. So I always play a fade. I always go on the right so the tee. As far I can. Hit away from these trees of the shoot out the left side and play it that way. That's exactly where I wanted to hit it right there. I wanted to talk about lamb because a lot of people freak out in America about lamb. -So this is different. An old lamb is called mutton. And if you find a good source of lamb it's phenomenal. STEVE ELKINGTON: Small bones. Small bones, young lamb. CHEF RAFAELE: Small loin, big like the chop. You know sometimes you have a lamp chop. Yeah, too big. -So here we go. Now we-- very simple. Olive oil, salt, pepper and a little seasoning, rosemary. ROCCO MEDIATE: So the fresher the lamb, you don't what anything on it but what you're putting on it. Gotcha. -It kills the taste of mutton. -A lady, many years ago she came over as she goes, well I don't see any mint jelly on this. I said, well what do you need jelly for? She says, because you cannot eat lamb unless you have mint jelly. Because it stinks too bad. I said, then you are not eating lamb, you are eating mutton. ROCCO MEDIATE: Mutton. I didn't know that. No I know. That's cool. -So that's what meat. You can eat lamb or you eat mutton. The lamb is ready, potatoes, asparagus, You know we got it all. -Look how pretty that is. JESS: Aw, it looks amazing. I can do a bite, it's just, I don't know. It's the gamey taste to it. STEVE ELKINGTON: No game here. CHEF RAFAELE: I'm willing to bet you she is going to finish it. ROCCO MEDIATE: Do you really like it or not? JESS: I do like it. ROCCO MEDIATE: Good. That's a huge deal because she doesn't like lamb, trust me. CHEF RAFAELE: We made progress. We have fun when we play golf together, Rocco and I do. STEVE ELKINGTON: I learned some things today. And we showed off a little bit today and we showed people how to hit some of these curve shots. Oh Yeah. We had a lot of fun and he and I really enjoy that-- making that ball do what we want it to do and we did it. It was fun. -I don't think you got a chance. -Watch this. Watch this right now. ROCCO MEDIATE: This is a waste of time. Me-- nuh-- nuh! Ah, see he's lucky. He's lucky. Get that ball out of the hole. That was a blast. STEVE ELKINGTON: Here's what I learned tonight. I took one of my great friends, Rocco Mediate, I tagged him, and I blended him with a chef. -And he taught us how easy it is to make true Italian food. We only ate one little pasta thing and I'm telling you it was one of the best meals I've ever had in my life and I learned so much. And I want to thank you so much. -We're going to be hanging-- we're gonna be-- he is going to be sick and tired of us. NARRATOR: On the next episode of The Rural Golfer we head north of the border to the home of Mike Maves. MIKE MAVES: The Niagara region we're very proud of the Niagara Falls and our agriculture. And conservation. MIKE MAVES: Look at that. NARRATOR: --and finally meet the elusive cameraman. -I don't need to be a professional golfer. I just want to get a little bit better. MIKE MAVES: I'm still amazed. I'm still. And you're still clueless. -I don't like your driver. -I'm in trouble and I haven't even taken a swing. 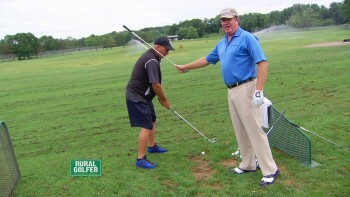 NARRATOR: We remind Maves of getting his first lesson from Canadian golf legend Bill Kozak. -I think that's the best one right there. -Now how in the hell do you do this shot? NARRATOR: And see how we gets out of one sand trap but finds another. -This is the Sand Trap. -Told you I'd be here. -All right, thanks for stopping by. Can I grab you a cold one?